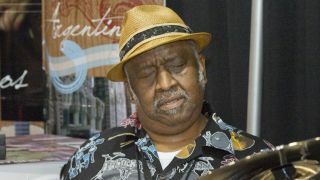 Bernard 'Pretty' Purdie sits among the greatest drummers of all time. Although best known for his work with Aretha Franklin and Steely Dan, he claims to be a fixture on more than 4000 albums by over 2500 artists. While that figure can't be confirmed, his oft-cited status as 'the world's most recorded drummer' is probably accurate. The 'Purdie shuffle', then, is a groove of his own invention, its definitive outing being Steely Dan's Home At Last. This half-time variation on a regular shuffle pattern combines locomotion and pace with a beautifully laid-back vibe. It not only makes for a great groove as is, but is also highly customisable, thanks to the amount of adaptable space in the kick drum line, and the ease with which hi-hat kicks can be thrown in. Timing and velocity nuances are everything when it comes to vibe and funk, and few drum parts demonstrate that as clearly as this one. For the producer accustomed to laying down four-to-the-floor electronic stompers, a rhythm like this can be enlightening to program - and while it was obviously conceived with acoustic drums in mind, there's no reason why it can't be used to trigger drum machines and the like, too. Before you start off, get yourself in the mood by checking out Steely Dan's Donald Fagen and Walter Becker, and Purdie himself, discussing this most seminal of beats. To watch the video accompanying this tutorial, get hold of Computer Music issue 214, which is on sale now. Step 1: We're using GarageBand, which comes free with every Mac. To program triplets, we've got to switch to the Score editor (where you can adjust the grid), or set the off-grid notes by hand. We do at least have triplet quantise settings. Load up the SoCal drum kit, turn the hi-hats up a bit, set the cycle range to two bars, and adjust Tempo to 140bpm. Step 2: The top line of the Purdie shuffle is a shuffled hi-hat pattern, with the pedal 'stomped' on every quarter-note beat, resulting - in simple terms - in alternating open/choked and closed hats. To start with, though, just program the pattern on a single note. You can record the part in real time on your keyboard or draw it in. Leave it unquantised for a 'live' feel. Step 3: GarageBand's SoCal kit might not be ideal for emulating the intricacies of such an expressive hi-hat pattern, but we can get pretty close by using its pedalled sound for most of the offbeat hits, and its fully open sound (at lower velocity) for accents at the end of each bar, curtailed by the pedalled sound every half bar. Step 4: The kick drum is easy enough: a downbeat hit followed by a lead into the snare and a lead into the downbeat of the second bar. The non-downbeat hits are best positioned manually (or played in live). Pre-downbeat hits can be humanised by setting them to a lower velocity than the subsequent downbeat hits. Step 5: It's the interplay between snare and hats that really makes the Purdie shuffle the funky monster that it is. Place full-velocity snare hits on beat 3 of each bar - there's your half-time backbeat. Now place much lower velocity hits (ghost notes) in the middle gaps of the first, second and fourth sets of hi-hat triplets. Step 6: With the basic groove constructed, you have a template on which to build your own variations. The kick drum is ripe for adjustment, since it's the simplest of the three elements; but moving the open hi-hats around can change things up nicely, too.